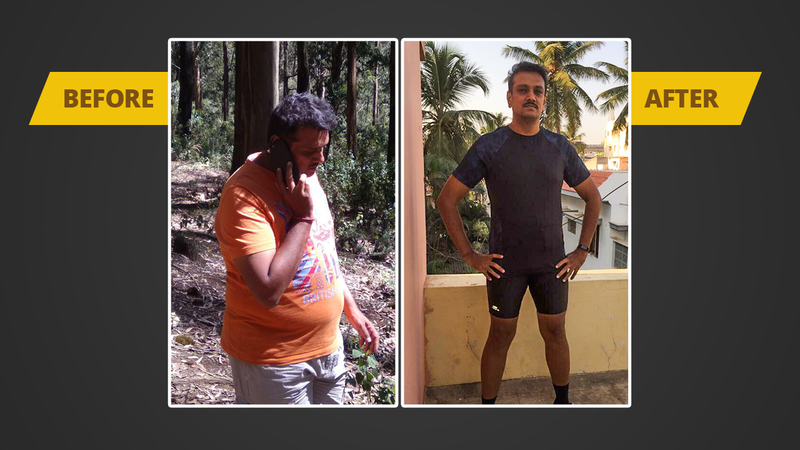 Santosh Krishnan, a type 2 diabetic decided to rise above his excuses to lead by example. Santosh had an HBA1C reading of 8.4 which was alarming for a diabetic. 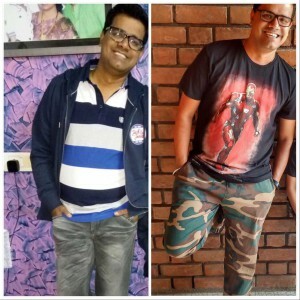 In August 2017, Santosh with the help of a personal coach decided to turn his life around, setting a long-term goal of reversing diabetes which was holding him back from his desired quality of life. Initially his levels were (Fasting: 176, Post Prandial: 204, Weight: 77kgs ) and results didn’t come easy or instantly but with a great level of patience and determination tethered with a supervised diet and exercises, he brought down his levels to ( Fasting: 95, Post Prandial: 139, Weight: 69.8 kgs ). Today, he has an HBA1C reading of 6.8 which is completely normal. When asked, Santosh had much to say about his achievement and he was immensely proud of himself. Presenting his story in his own words. 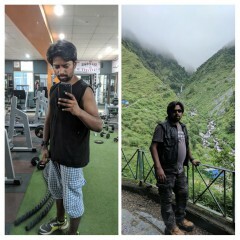 “My journey with GOQii started in the month of April 2017. Being a follower of Luke Coutinho on Facebook, I wasn’t new to the world of health and fitness. One day I happened to come across a fitness band called GOQii on my friend’s wrist and immediately ordered one for myself. Ever since I came on board the GOQii Platform, there has been no turning back. However, it was not a smooth journey. Later, I got to know that Luke was the Master Coach at GOQii. My journey with GOQii has had its ups and downs and I remember at one point I was corresponding directly with Vishal Gondal, the Founder, and CEO of GOQii because things didn’t go my way. I recall the time when I had changed three coaches in a span of four months, ultimately realizing that it was me who needed a makeover on my attitude, but as you will understand, it is easier to blame someone else than take it upon oneself. My current coach has played a crucial rule in my health. I’m a type 2 diabetic and there was a time when my sugar readings were extremely high. Over the past 6 to 8 months we have made small changes to my lifestyle by introducing new elements like the consumption of ACV, actively keeping a track of all my required activities, which by the way has helped me immensely by giving me an understanding of where I stand and what I should do. What did his GOQii Coach have to say? Santosh’s GOQii Coach was very enthusiastic to talk about her client and was very proud of his achievements. Here is what she had to say: “Santosh’s goal was to reverse diabetes and become healthy again. After my initial call with him, I understood that he’s focused and knows what he wants for himself. We began with basic exercises gradually including cardio and body exercises to the regime. We worked on a schedule per his convenience, I also advised him about the importance of frequent meals, pre-workout and post work out meals, water etc, which he followed religiously. It was a pleasure to see his data on the dashboard, which motivated me to concentrate more on his progress”. “He seems to have taken charge of his health and his recent reports show that his sugar levels have come down drastically. 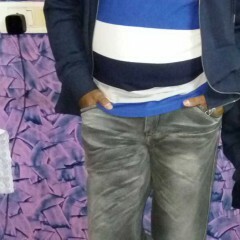 He lost around three kgs and reduced a few inches on the waist as well. Santosh is super happy with his progress and so am I. It feels great to be a part of his amazing journey,” she adds. 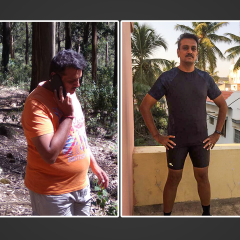 Santosh has left no space for self-doubt in his endeavours and has been patient, constantly pushing his limits to further improve his glittering morale and a healthier lifestyle. How many times have we come across movies or a television drama series where the protagonist defies all the odds, overcomes challenges and despite all the insurmountable hurdles, wins? We can’t ignore the obvious catharsis we feel and the emotional bonds we form with a protagonist’s journey. We can’t deny the overwhelming sense of joy we experience at their eventual success. While we all love rooting for a beloved fictional character, we need to remember that there are real heroes out there who face their own struggles head on and emerge victorious. One such hero is none other than our GOQii Play Coach Aliya Imran. Born in Mumbai, Aliya Imran spent some years in the city and then shifted to Vadodara. Although her schooling was normal, she did not experience a peaceful childhood. Despite her emotionally challenging circumstances, she was a healthy child. At the age of 13, Aliya was diagnosed with jaundice. It was so severe that no doctor was willing to admit her in their hospital. Stress coupled with a weak immune system triggered Vitiligo (A disease that causes the loss of skin colour in blotches) which became a permanent feature. Her Vitiligo increased and decreased with her stress levels. She married at the age of 19, moved to Gurugram and completed her graduation. The trauma from a miscarriage at the age of 22 further aggravated her Vitiligo, causing it to spread all over her hands and face. She delivered her first child in 2009. Her weight had then increased to 79 kg. After being blessed with a second child in 2011, her weight further increased to 85 kg. Her Vitiligo issue hadn’t gotten any better. She faced discrimination due to her Vitiligo issue. One such instance was during a pilgrimage with her family, a woman serving herself some food beside her threw the plate and walked away in disgust after looking at Aliya’s Vitiligo patches. By the end of 2013, she returned to Mumbai. At this point in time, Aliya felt completely hopeless about her weight gain issue as well as her skin condition. Something had to be done! One fine day, she decided that she had enough! She thought to herself, “If I can’t fix Vitiligo, let me at least fix my weight!” She immediately joined a gym nearby. Not wasting a moment, she sat on the Spinning Bike and started spinning with vengeance! She didn’t have a clue about exercise or fitness and there was no one to guide her either. She just went with whatever caught her attention. Soon enough, she began running along with working out. 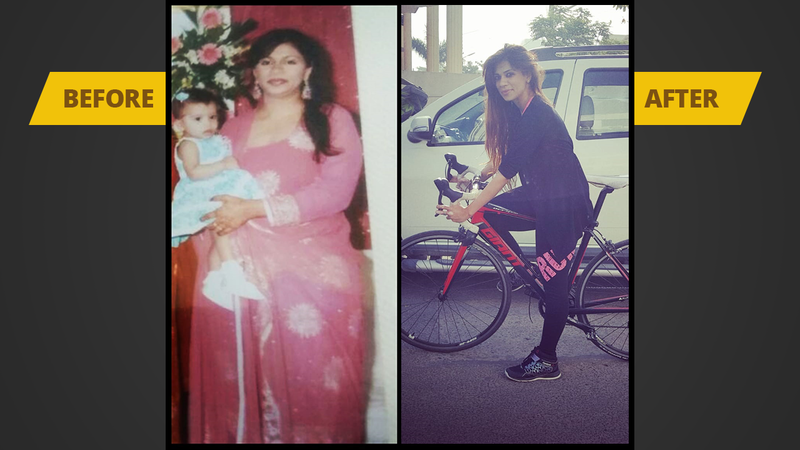 She performed high intensity cardio with a day’s rest, never skipped a single gym day for 3 months and managed to reduce 9 kg. Later, she returned to Gurugram, joined a college and completed an Interior Designing course. She joined a gym there as well. Obsessed with fitness, she used to do stair exercises before hitting the gym. Her family members and friends thought she had gone crazy but that didn’t stop her. She slowly began weight training. She used to have only one meal a day without realizing that it was a fasting method. After attending one of GOQii Master Coach Luke Coutinho’s sessions, she found out that what she had been doing was Intermittent Fasting. This further encouraged her to fine tune her eating habits. She strictly avoided junk and outside foods and sought a high protein diet. By the end of 2014, she weighed only 50 kg. She had lost 25 kg in a year without going on any crash diet. She achieved this through mindful eating and intense physical activity only. This gave a tremendous boost to her self-confidence, especially when her college and neighborhood acquaintances commented on her physique and unbelievable age. One such instance of the boost in her confidence was when she was discriminated again for her skin condition. It was at a spa when an attendant refused to touch her. This was a similar situation as before but only this time, Aliya stood up for herself. Her confidence was sky high, never to be deterred again. Around this time, gym instructors suggested that she take up fitness as a profession. They were convinced that she would be a success considering her dedication and hunger for fitness. Taking their advice, she completed her Zumba certification in 2016 and also got a spinning license. Between 2015-2016, she achieved professional success, accolades and was sought by leading gyms in Gurugram to join them as an instructor. Aliya Imran shifted to Mumbai in 2017. She completed a few more certifications which included Pilates Training License and Reebok Training. Aliya also completed a certification in Personal Training and Nutrition from Dubai. She opened a home studio and began taking in clients, both from India and abroad. In 2018, she acquired a Master Functional Training certification by ACE. Later that year, in September, she came to GOQii. She identified with the GOQii ideology that thrives on guiding and motivating people to lead a healthier lifestyle. The rest is history! Since joining GOQii Play as a coach, Aliya has had 1,734.3k views, 1,231k likes and has 183,347 players who have enrolled for her class! If that’s not amazing, then what is? It wasn’t an easy journey to have come this far. She had to constantly maintain her weight from 2014 to 2019, improvise on her own fitness and at the same time bring variety and content to her clients. 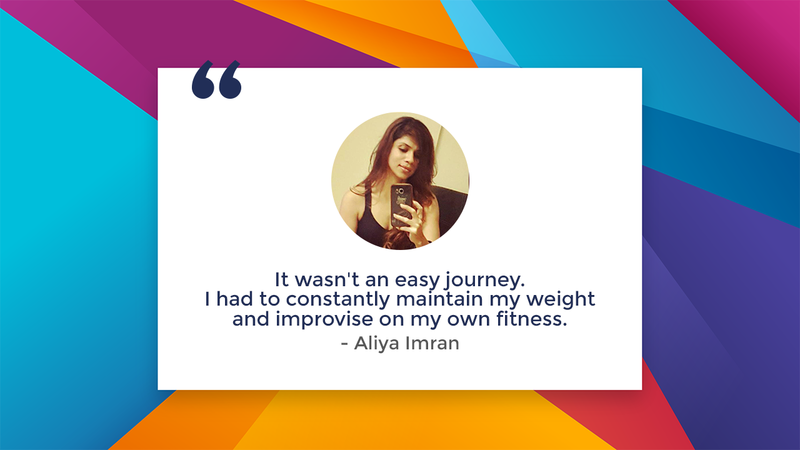 Aliya Imran attributes her success to her persistent efforts, her never-say-die attitude and the will to change without getting bogged down by limitations. She also thanks God for the tremendous support she has received from her family and her husband for motivating her. We all face hurdles from time to time. If you have faced similar issues, know that there is always a way you can beat your circumstances and emerge as the best version of yourself! Has fitness ever taken a backseat with you? Have you ever been active in the early days of schooling but as life and work caught up, your lifestyle became more sedentary? Did junk food and aerated beverages replace delicious, home-cooked meals? While it is comforting to know that you’re not the only one, somewhere it has to stop. At some point, you need to stop and question your lifestyle choices. You need to make a lifestyle change just like our player Kartik Aggarwal did. Kartik Aggarwal was always into sports. Since school, he was quite active. He has even represented his school in rollerskating. After graduation, work consumed most of Kartik’s time. Fitness became an alien entity to him. Health became secondary. He began skipping meals, his water intake was low and he treated himself to carbonated drinks more than often. Kartik Aggarwal had initially joined GOQii to study the application. He wanted to understand how the interface and the fitness tracker works. As the case with all new players, Kartik was asked to set a goal. His goal was to lose weight and maintain a healthy lifestyle. He began by regularizing his meal timings. Every morning, he drank a jug full of water. He completely cut off tea and coffee. If he craves for aerated drinks, he has buttermilk or lemonade. On the fitness front, he exercises 5-6 times a week. He works out either in the gym or takes a walk in a park nearby. Kartik has begun taking the stairs and avoids elevators or escalators. Given his busy schedule, Kartik Aggarwal manages to take short walks every hour or so. He tunes in to Ronak Gajjar’s Meditation Class on GOQii Play as that’s the only show he can squeeze into his schedule. After being active on the GOQii app, Kartik Aggarwal received an email from GOQii. The email was for an Active Sunday registration. He signed up and has never looked back. Since then, Kartik has been a one-man army who regularly champions the GOQii Active Sunday sessions in Ghaziabad. 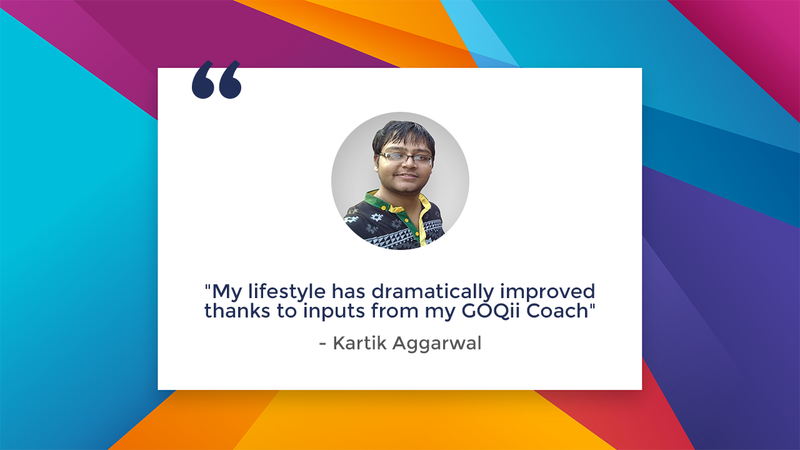 What Did Kartik Aggarwal Have To Say About His GOQii Coach? When asked about his coach, Kartik said that his GOQii Coach has been really helpful. She persistently follows up with him to complete his habits, despite the fact that he is not active on the app due to commitments from work. Although he doesn’t even get the time to check his phone, thanks to her dedication, he has been following his habits as much as possible. 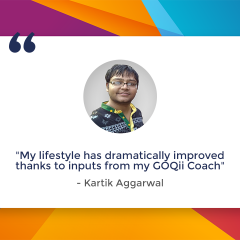 Since joining GOQii, Kartik has lost about 7 kg. He says that his lifestyle has dramatically improved, especially his eating habits, thanks to inputs from his GOQii Coach! Kartik will be live on GOQii Play soon. Tune in to his show to know more about his journey to a healthy and active lifestyle!